Yesterday I made it to the wetland NNW of Wolf Mountain and had a really good day, so it is time for another report…. I began the day trying to check out some wetland areas right off of 2308. Road 2308 itself has a big rockslide after half a mile so the first ones were a no go. I went up a little dirt road near the intersection of 2308 and 2307 to look at stuff at T22S.R4E.sec 35. There was a very boring old wetland of 5′ Scirpus microcarpus and such. The pond that shows on the maps is no longer there. But the big lake to the northeast was very nice. 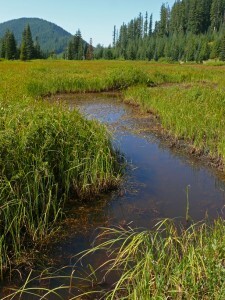 Not much of a wetland (unless you’re a sedgehead! ), mostly tall stuff including cattails, also lots of Comarum palustre. Loads of aquatics though. The pondlilies were really tall, some of them sticking 3′ above the water. There was Sparganium with a few blossoms left, duckweed and 3 kinds of Potamogetons. I saw Potamogeton pusillus for the first time. There was lots of P. natans and some other one I couldn’t get near enough to even photograph. There’s no bank, so I had to go out on some logs to get to the open water. I scared up a bunch of yellow jackets nesting in one, and was extremely thankful they didn’t sting me. I was not so lucky last year at Bristow Prairie in almost the same situation. I was able to avoid testing my luck again by returning on a different log. 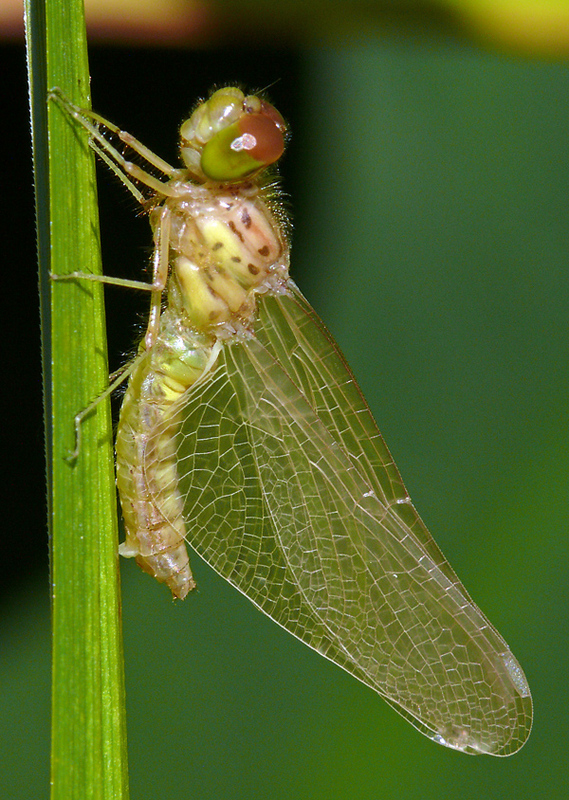 In a more pleasant insect encounter, I saw a newly emerged dragonfly pumping up its wings. It was really pale. I wonder how long it takes the color to develop? I went up to the Warfield Creek bog via Rd 2316 to Wolf Mountain. On the way up, I passed a little creek spilling down the bank with a gorgeous display of picture-perfect Parnassia cirrata. There was also a lot of faded Micranthes (Saxifraga) odontoloma. I stopped up at the top at the intersection of the spur road up to the top of Wolf Mountain. There is a great view of the wetland and also all the ridges to the north including Bunchgrass Ridge, Verdun Rock, and Mount David Douglas. I went up the Wolf Mountain Road a short ways before deciding it was a bit too rough, and I didn’t have time to move rocks to make it safer. Loads of Rainera stricta and other things. It was probably very pretty a month ago. The lake is right next to a spur road off of 2316. It is very cute and not lined with muck like most of the lakes I’ve been to lately. But I also didn’t need to go into the water because the Potamogetons were right up near the edge. There was one large patch of P. natans and several of another I’d never seen before which I’m pretty sure now is P. alpinus. While eating my lunch, I checked out the east side of the lake and was surprised and thrilled to find Gentianopsis simplex still in decent in bloom. On my way back at the end of the day, I did a careful count and found 56 in total: 32 in one small area, 23 more scattered about the middle part of the east side, and 1 individual on the west side of the lake. Growing with them was fading Spiranthes stellata. Both of these grow at the wetland by Hemlock Butte about 5 miles to the southeast. The wetland is pretty cool. I’m calling the place Warfield Creek Bog because the maps show Warfield Creek going through it, but there doesn’t seem to be a real open running creek visible anywhere, not even downhill across the road. The little black squiggles in the aerial photo are indeed little pools. It was likely once a meandering creek, but now most of the open water is separated into discreet pools. What really fascinated me is that each pool has a different collection of aquatics. 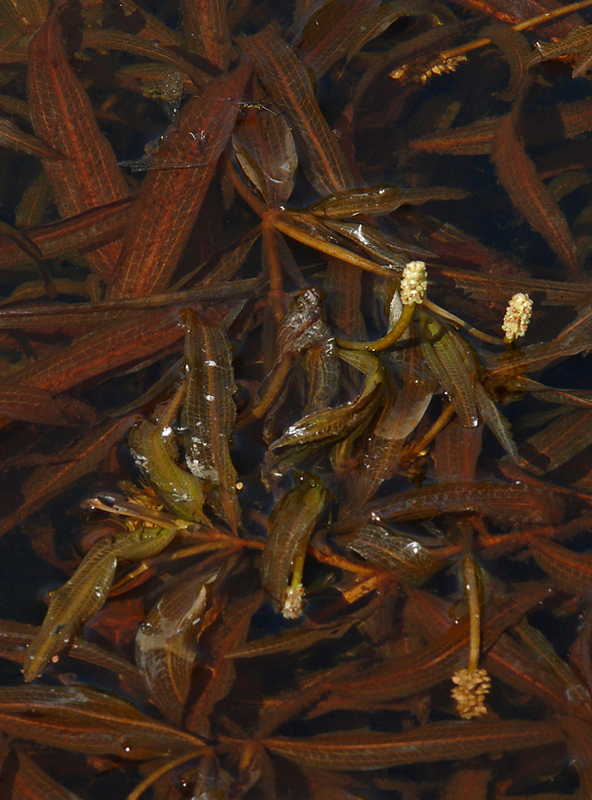 One had nothing but Potamogeton alpinus, while 10 feet away it was almost entirely P. natans. The next one I looked at had Sparganium angustifolium, P. alpinus, and the tiny P. pusillus. A little farther, a deeper pool was entirely very large Sparganium emersum. Several were very shallow and filled with Menyanthes trifoliata. Not surprisingly, the plants are very picky about water depth. 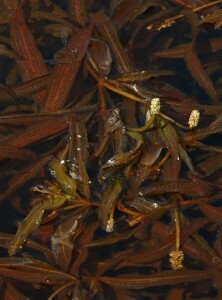 Potamogeton alpinus in one of the channel pools. Note how it is logged right up to the edge of the wetland. The rest of the wetland was a mixture of just two levels: wet mud (solid underfoot though) with sedges and slightly higher ground covered with sphagnum moss, Dodecatheon jeffreyi, Pedicularis groenlandica, Vaccinium occidentale, and Triantha occidentalis. There are no hummocks like you’d find Kalmia on. It must have been gorgeous in the spring with all the shooting stars, also Caltha leptosepala and skunk cabbage in some areas, and I will definitely try to get back next year. About the only things left in bloom were Canadanthus modestus, some Spiraea, and some of the aquatics. There were many patches of cottongrass, a lot of Epilobium oregonense, and I eventually found Drosera rotundifolia at the northwestern end of the bog. It is somewhat ringed with Spiraea douglasii and willows, mostly Geyer’s and the small green one that I’m still guessing is Salix commutata. It had loads of those rosebud-shaped galls (?) like I’ve seen at Gold Lake Bog. The southern end is entirely filled with willows and fairly impenetrable, but the rest is easy to get around except for the wet, which may be a big problem in the spring. But you don’t have to punch through shrubs if you don’t want to. I’m getting sick of that and have the scratches and bruises to show for it. I took a different route back, following 2316 to the northwest. It turned out it was almost exactly the same amount of (good) gravel road but cuts off 7 miles of Rd 23.